Last week we learned that many Americans are unsure if their retirement savings are on the right track, but what exactly is “the right track?” T. Rowe Price estimated that by age 30 you should have at least half of your annual income set aside for retirement. That jumps to around two times your yearly earnings by age 40, five times by age 55, and eight times by age 65. However, much larger multiples of your annual income could be needed depending on your tax bracket, marital status, and the standard of living you plan on maintaining in old age. 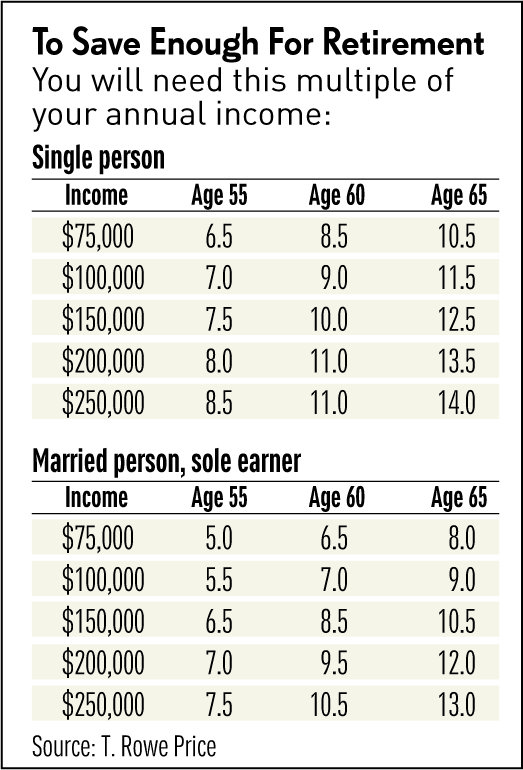 Further, these are just rough calculations meant to help people quickly compare their current savings to what retirement experts believe a “typical American” should aim for at various stages in life. Since financial situations and retirement goals can vary significantly from person to person, some people may benefit greatly from the bespoke savings plans available by working with a professional advisor. As for those interested in a simpler strategy, a good rule of thumb is to set aside as much money as possible each year, and the earlier you can start the better. Encouragingly, a new Bankrate poll that asked U.S. adults to list important financial milestones found that 22 is perceived as the best age to start saving for retirement. That is not too surprising since 22 is around the same age many people will likely plan on graduating from college and entering the workforce. However, things do not always go according to plan, and financial obligations such as medical bills and student loan payments have become savings hurdles for many Americans. In fact, a recent Transamerica survey found that the median worker “waited” until age 27 to begin setting money aside for retirement. Millennials started saving at a much younger age (age 24) compared to Gen-X (age 30) and Baby Boomers (age 35), but in general it appears that many Americans from all generations had a hard time setting money aside for retirement as soon as they would have liked. Although an early start will definitely make it a lot easier to achieve an ideal old-age lifestyle, individuals that had to wait should not be discouraged from striving for their dream retirement. For example, a great way to help make up for a late start is to begin maxing out the contributions to 401(k)s and other tax-advantaged savings vehicles each year, especially later in life when the annual limits are raised. Additional assistance as usual is available by working with a professional financial advisor who can assist you in identifying the course corrections that are needed to truly get you retirement finances on the right track.